Spaghetti squash doesn’t have to take a long time to make. In fact, it can go from being on your counter to your plate in less than 20 minutes! 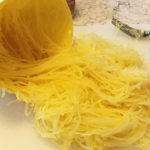 Long strands of ‘noodles’ from our spaghetti squash. Spaghetti squash is gaining in popularity with so many people wanting to eat more veggies and limit the amount of carbohydrates that they eat. However, some people steer away from making it because it takes too long. With the Instant Pot Pressure Cooker, you can have spaghetti squash on your table in no time! Not wanting to eat it right away? No problem! Make it a day or two in advance and place it in the refrigerator until you are ready. Cut the the squash crosswise to get long noodles. If you search how to make spaghetti squash most recipes will tell you to cut the squash lengthwise (from top to bottom). Although this technique will result in soft and tender noodles, the strands will be short and not resemble spaghetti at all! The key to getting long noodles is to cut the squash through the center. When the top and bottom halves are cooked, you can easily pull out the long noodles with a fork. You can use the squash noodles as a direct replacement for traditional spaghetti noodles. The thickness resembles angel hair or thin spaghetti. See our recipe: Spaghetti Squash Casserole. To receive our 3 Recipe Articles in your inbox each week, sign up for our free email list. You can also follow us on Facebook, Twitter, Pinterest, or Instagram. This article may contain affiliate links. Making spaghetti squash is super easy and healthy. The key to getting noodles that resembles spaghetti is to cut your squash crosswise, not lengthwise. 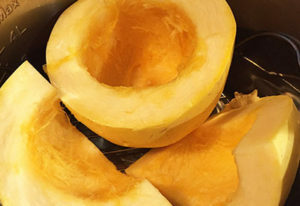 Cut spaghetti squash in half crosswise so that you have a top and bottom piece. Clean out the seeds. Add water to the instant pot and insert trivet. Add spaghetti squash pieces, face side up on top of the trivet. Close lid and set valve to sealing position. Place Instant Pot on Manual Pressure, High for 7 minutes. Once time is up allow for 7 minutes of natural pressure release then carefully quick release the remaining pressure. Remove squash with tongs and let cool enough to handle. Remove spaghetti strands with a fork. Preheat oven to 400 degrees F. Cut and clean out spaghetti squash as instructed above. Add water to a 9x13 baking dish Place squash, cut side down in the baking dish. Bake for 40 minutes or until desired tenderness. Remove from oven and let cool enough to be handled. Remove spaghetti strands with a fork. 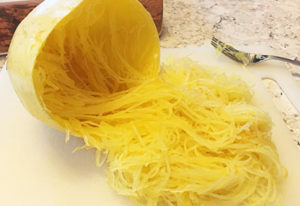 If you prefer your spaghetti squash noodles firmer, decrease cooking time to 5 minutes for the Instant Pot.